Immigration was a big factor in the 2016 EU referendum. It featured heavily in the campaign, often in contentious ways, and views about Britain’s migration system map strongly onto referendum vote choices — opposition to immigration on any measure strongly predicted support for “Leave”, while those with positive views of migration leaned heavily to “Remain”. But did the referendum result change things, and if so, how? Has a majority vote to leave the EU and the subsequent embrace of a “Hard Brexit” position ending freedom of movement to Britain from elsewhere in the EU intensified public hostility to immigration? Or has the possibility of a dramatic restrictive shift in policy, with its associated economic and social costs, and disruption to the rights of migrant EU citizens living in Britain lead to greater awareness of hitherto overlooked benefits from migration? Perhaps both things have happened at once, polarising an already divided electorate into more firmly “anti migration” and “pro migration” camps? I focus on three of the many facets of the immigration issue here. Firstly, salience: how important do people see it as a issue? What share of the public regard it as a top priority? 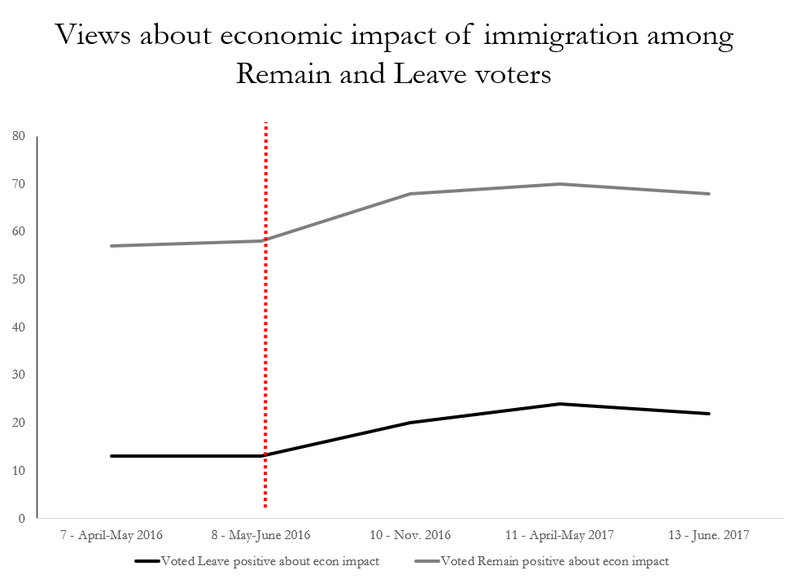 Secondly, impacts: do people think that immigration has a positive or negative effect, economically and culturally? Thirdly, polarisation: have people become more divided about the effects of immigration? On the first three measures, there is a consistent story: the public have become more positive about immigration. Far fewer see it as a major political priority and more see it as positive for Britain’s economy and culture. What is more, this shift is seen across the board — it isn’t a case of liberal “Remainers” rallying behind migrants, while migrant sceptic “Leavers” dig in their heels. The positive shift in attitudes seems to be occurring across the political and social spectrum. 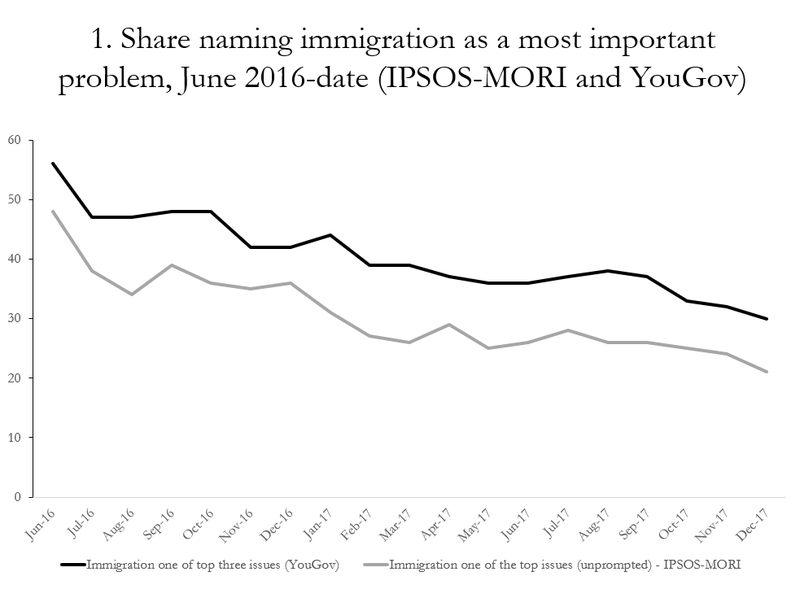 The share spontaneously naming immigration as a top priority has fallen continuously since the Brexit vote. It is now at its lowest level since the financial crisis and recession in 2008–9 — if the fall continues it will soon be at its lowest level since before the accession of the A8 EU countries in 2004. Here’s the impacts data. This comes from the British Election Study panel fielded by YouGov on a regular basis to a very large representative sample of respondents. The panel regularly asks people whether they think immigration is good or bad for the economy, and whether they think it enriches or undermines cultural life. There is a big, sustained jump in the share of positive responses on both of these measures after the Brexit vote (shown by the red dashed line). Immigration optimists now significantly outnumber pessimists on the economic measure, while on the cultural measure optimists and pessimists are now balanced. Before Brexit, pessimists were the larger group on both measures. Finally, a couple of graphs to illustrate the polarisation story. The first shows the share of degree holders and those with GCSE qualifications or less who are positive about immigration. I use this measure as education levels have always had a strong link to views of migration — graduates are very positive, school leavers are very negative. As we can see, both groups show a similar positive shift in attitudes after the Brexit vote. The two groups still have very different views, but both are more positive than they were. It is the same story with reported “Leave” and “Remain” voting. Here I use the vote reported in the wave immediately after Brexit throughout, to avoid any problems from people switching their recalled vote to fit their current preferences. Again, we find the same pattern — a very big difference in outlook, with Remainers very positive and Leavers very negative, but a positive shift of similar magnitude in both groups. These findings are not isolated to a single study either — a panel study by IPSOS-MORI found the same positive shift in attitudes in the wake of Brexit, as did another academic panel study by a team based at University College London, which is not yet public but whose initial findings I saw in a recent presentation. These findings raise a number of puzzles, which I hope to return to in future. Firstly, why has this change happened? Immigration policy hasn’t changed, and while migration levels have dropped somewhat, they remain high by historical standards and a long way above the government’s “tens of thousands” net migration target. The vote to leave the EU didn’t change anything on its own. Yet voters across the political spectrum seem to have taken it as a cue to worry about immigration less, and appreciate it more. Why? Secondly, why isn’t this shift more widely known and discussed on the pro-migration, “Remain” side of politics. Here I must resort to anecdote and unrepresentative data a little, but it is my firm impression that politically active “Remainers” and migration liberals tend to believe things have become worse since Brexit. To test this hunch, I offered my twitter followers a poll asking how they thought attitudes have changed. Only one in five of the thousand or so who responded thought attitudes had become more positive, while nearly twice that number thought they had become more negative. Twitter polls are, I hasten to emphasise, wholly unscientific and unrepresentative. However, as a migration and politics academic, I’m certain my twitter sample heavily over-represents the politically engaged, migration activists, graduates and social liberals. It does seem that the conventional wisdom among this unusually well informed and engaged group is that migration attitudes have hardened since Brexit. Yet the evidence robustly points in the opposite direction. Why? Thirdly (and relatedly), why aren’t those in politics, society and the media who favour a more open, liberal migration policy making greater use of this information to make a case for more liberal policy? Before Brexit, the socially conservative press and commentators would always make a big fuss about every new piece of polling showing widespread negativity in the public. Yet (again lapsing into anecdote) it seems to me that the positive shift of the last 18 months or so has received much less attention from liberal media outlets and activist groups and, indeed, when I have mentioned such findings on social media, the response from migration liberals tends to be scepticism rather than optimism. The data suggest the electorate is more receptive to a positive case for migration than it has been for many years — yet these polling findings are not widely known and discussed by migration liberals. Why? I don’t really have good answers on any of these questions, or the others prompted by these findings. But it is clear that public opinion on immigration is changing fast, and in interesting and unexpected ways. That deserves more attention and discussion. University of Manchester politics professor. Immigration, prejudice, welfare state, public opinion, psephology.